Over the past year we’ve been filming most of our games and scrims; it’s also a requirement for British Championships. 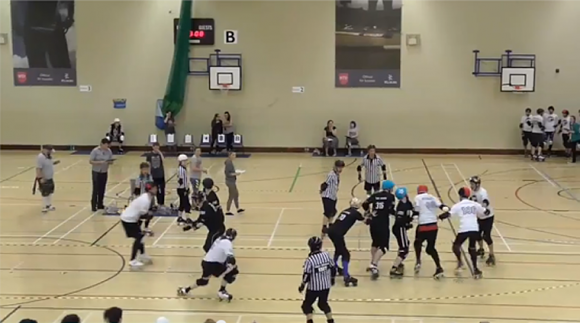 Footage from some teams has been disappointing because it’s been filmed from a static camera where you can barely see what’s going on. Game reviews are a whole lot easier when the footage is clear and concise. We thought we’d share how we do it without any snazzy paid for software. You don’t need to have people with experience to film; it’s just pressing a button and pointing the camera; the kit does the hard work for you! 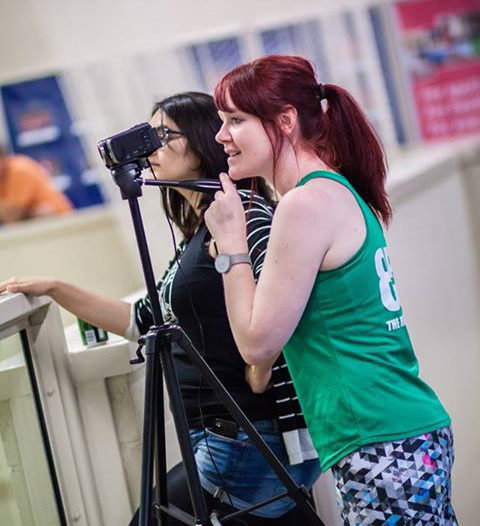 We usually have 2 members manning the camera so they can swap each jam to allow silent cheering and arm waving. Camera bag – £7.50 from Currys – Keep your kit safe! It’s best to have someone manning the camera and zoom in, making sure they FOLLOW THE PACK. Top Tip: Zoom out to where you can see the players if they start bridging off the front or back of the pack. Record each jam separately. It’s easier to play back and edit. At the start of each jam, speak into the camera to say the score. This means you don’t have to do any fancy editing and still allows for an easy game review. Download Freemake Video Converter. It’s free software to join and export the footage files. Link HERE. Click the video icon in the top left and select all your files from the first half (mine tends to crash if I do both halves in one) to bring them into the software. Make sure you click the ‘join files’ button in the top right. This means it will join all the individual jams into one file. Select the file type you want to export by clicking on the icon along the bottom. I usually select Mp4. Then select ‘same as source’ from the drop down menu (or HD720p if you want it to upload slightly faster to Youtube.) Click ‘convert’. Then do the same for the second half. Log into your YouTube channel and upload the files. It’s likely to take a few hours so you’ll probably want to leave it uploading overnight. Top Tip: Turn off sleep mode on your computer so it uploads throughout the night. Select the right level of privacy, we use ‘unlisted’ so that we can send the links out to the teams, referees etc but so that it can’t be seen by people who don’t have the link. If you have any questions email info@nottsrollerderby.co.uk and we’ll see if we can do anything to help. This entry was posted in Tips by TheRuthHurts. Bookmark the permalink.